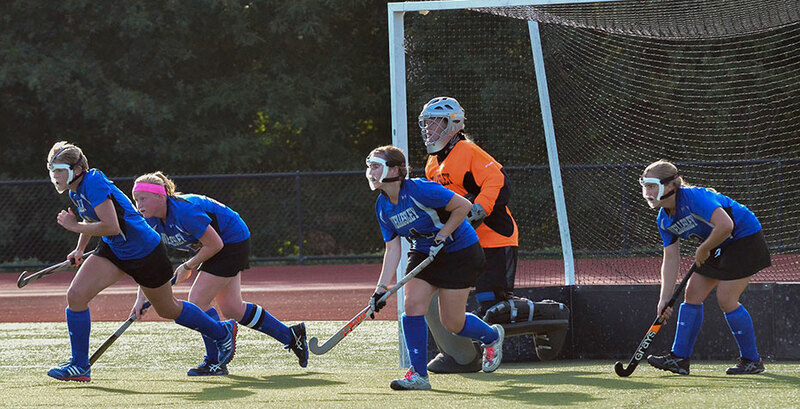 For more than these brief summaries from Wellesley's varsity fall season, see the Wellesley Blue website. For the second consecutive year Blue Field Hockey brought home the NEWMAC Championship and advanced to the elite eight of the NCAA Tournament. Led by senior captains Nathalie Gruet (the back-to-back winner of NEWMAC Player of the Year award) and Meghan Peterson (a first team All-Conference selection), the Blue went 19-3, setting a program record for wins in a season. Gruet and Peterson were joined on the All-Conference first team by junior Anissa Sridhar. In, addition senior Lallie Lukens and junior Hannah Flesch both earned a spot on the All-Conference second team. Finally, head coach Julia King garnered her second consecutive NEWMAC Coach of the Year Award. Blue Crew posted its best-ever finish at the 50th Head Of The Charles Regatta on October 19. The Blue finished third out of 30 boats in the collegiate eight event with a time of 17:42.663. Blue Crew then captured its sixth consecutive Seven Sisters Championship a week later, hosting the event this year on the Charles River. Led by All-Regatta recipients Sahar Ibrahim, Emma Reuder, Stephanie Kim, and Lauren Bazley, Wellesley finished with the top time in both varsity and both novice races. Crew will resume the season at Washington College in March. It was a historic fall for the Blue cross country team as Wellesley was selected as a participant for the 2014 NCAA Division III Cross Country Championships in Mason, Ohio. The appearance is the third in school history and the first since 1986! Entering the NCAA Championships, the team was ranked No. 25 in the nation, led by junior Priyanka Fouda, the 2014 Seven Sisters individual champion, and senior Taylor Bickford. Both earned NEWMAC and all-region honors and Fouda finished in the top 10 at this year’s NCAA Regional qualifier. Sophomore Mary Keenan joined Fouda and Bickford in the top 35 at the regionals to earn all-region recognition. Wellesley outdid its ranking and came in 22nd at the national meet, again led by Bickford, Fouda, and Keenan, with Nicole Chui '15, Alice Zhou '17, Eddie Sharon '17 and Sonja Cwik '17 contributing to the strong team finish. Blue Golf capped its fall season by hosting the annual Ann S. Batchelder Invitational at Nehoiden Golf Course. Junior Lei Wei was the top finisher, recording identical rounds of 90 for a 180 total, good for a 24th place tie. Senior Becca Berger shed nine strokes from the first day of the tournament to the second to finish in a tie for 28th place with a total of 183. The Wellesley golf team will resume its season at April’s Vassar Invitational. Wellesley Soccer closed the year with an 8-7-5 record, the program’s second winning season in a row. Junior defender Rianna Alyward earned NEWMAC All-Conference second team recognition, leading a Blue defense that posted nine shutouts on the season. Wellesley's defense was one of the best in the NEWMAC, surrendering less than a goal per game this season. The future looks bright on offense too as first year Melise Knowles led the team in scoring with five goals. The Wellesley tennis team jumped four spots to No. 24 in the ITA Division III Women's National Rankings this fall. The Blue finished the fall season as the NEWMAC regular season runner-up, advancing to the NEWMAC tournament semifinals after going 8-3 overall and 7-1 in conference play. Five Wellesley College student-athletes gained recognition for their play during the 2014 fall season: Andjela Stojkovic and Caroline Hsu garnered First Team All-Conference honors in doubles; Hsu and Carina Chen, Dasha Kostikina, and Sojung Lee all received All-Conference second team awards. Wellesley College volleyball senior co-captains Sydney Carfagno '15 and Caitlin Laughlin both received American Volleyball Coaches Association (AVCA) All-Region honors, with Carfagno receiving the award for the fourth straight season. Carfagno also earned her fourth straight NEWMAC All-Conference award, leading the Blue to a 17-11 overall record and 6-4 NEWMAC record. Wellesley captured a pair of thrilling 3-2 wins at the end of the regular season, including one over Springfield on senior day, before falling to regular season champion MIT in the NEWMAC tournament semifinals.